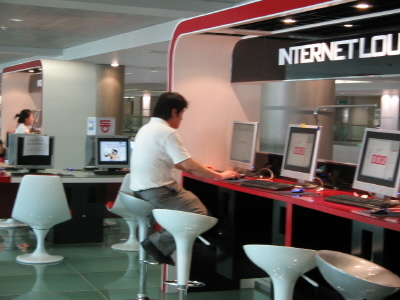 An Internet Lounge at Seoul's Airport. Photo via airport.kr. With the continuously escalating fees and deteriorating service of air travel, I’m almost shocked when I discover that perks still exist for coach fliers like me. But I’ve recently discovered a couple pleasant extras that are available to coach travelers on select routes/airlines. It’s all about finding pleasure in the little things, right? Reno/Tahoe to Los Angeles on Alaska/Horizon: On this short flight, coach passengers are treated to complimentary local beer and wine! It’s a nice way to kick off a long weekend in Lake Tahoe. Long Layovers in Seoul, Korea on Asiana: If you’re flying Asiana and have a long layover in Seoul (a common occurrence if you’re connecting to another destination in Asia), Asiana offers you a choice of either a complimentary Seoul city tour or a hotel room adjacent to the airport. This is a great way to make the most of a layover, or just catch up on sleep and have a nice shower before boarding another flight. Keep in mind: The Asiana offer is valid for just one leg of your trip–so if you opt for the city tour at the start of your journey, you won’t be able to get a hotel room on your way home. To book your tour or hotel room, call Asiana’s U.S. office after you’ve paid for your ticket. Bonus tip(s): I recently spent a long weekend in Tahoe and tried a few restaurants–click here for more details. Also, if you do have a layover in Seoul, make the most of the airport! It’s one of the best-reviewed in the world, and it boasts great amenities like free internet lounges, a traditional Korean spa, casino, culture museum and more. Hi! I was wondering if Asiana would offer complimentary city tour for united states permanent resident (non-us citizen but legally to live there). I heard from the rumors that non-u.s.-citizens are not offered with this complimentary service or a free hotel room to rest during the long layover.